No theme this month, Legions of the Unspoken. Instead, I would like to take a closer look at a character who has been in the limelight recently. You may have heard about the Supergirl show coming soon to the small screen. You may even have a significant other asking which comics featuring the Maid of Might they should read to prepare themselves. Hopefully you shrugged and pointed them towards Thunderworld because Mary Marvel is close enough. Supergirl is an interesting character. She has been around for decades and I could not, for the life of me, tell you a thing about her. When I started reading comics Supergirl had been murdered during Crisis on Infinite Earths but, strangely enough, she seemed to be doing just fine in the halcyon days of the S-Shield numbered covers of the Superman titles. What happened? Did she get better with the reboot? Did Zero Hour kick her back into her prime? No, of course not. Lex Luthor from a pocket universe cloned Lana Lang and the ensuing “protomatter being” helped John Byrne’s Man of Steel defeat General Zod before coming to the core DCU and promptly banging Lex Luthor while his mind was occupying his own cloned body and masquerading as his own son to the world at large. This Supergirl was not Linda Danvers. She never wore the white tee-shirt, had flaming wings, or was served a drink by the Der Führer (as you Fallen Angel fans out there may recall). This Supergirl is Mae, short for “Matrix,” and she was the version of the character that ushered in the nineties. She is unique from what came before and has been overshadowed by what came after but, in true Roger Stern fashion, her story was unique and worthy of your time. In the early days of 1994 Stern, along with artist June Brigman (co-creator of Power Pack and one of the only woman I can think of to draw anything related to Superman) helmed a four issue mini-series that explored the backstory of the Woman of Tomorrow (I am coining that because “Girl of Steel” is going to end me up on a watch list) and her place in the DCU. It features Lex Luthor II prominently and does a fair job at tying that particular plot thread up. Not sure what your reading habits are but if you enjoy what you read here you can pick the series up at “comiXology” (I love them but that branding has to go) all at once for an affordable price. What would come to be defined as this era’s Supergirl mostly came later, from Peter David, until it was promptly ignored by Jeph Loeb. You may also remember Dan “The Man Without a Plan” DiDio telling a roomful of confused onlookers that both Mae and her successor had been stricken from continuity. I forget if this was before or after he told similar rooms of people that Stephanie Brown had never really been Robin or that he could not wait to kill Nightwing (I do not know about you but I will never forgive him for Beast Machines never mind his DC work). All of this is to say that the powers that be have done all they can to wipe away the version of the character I first met. She deserves better. 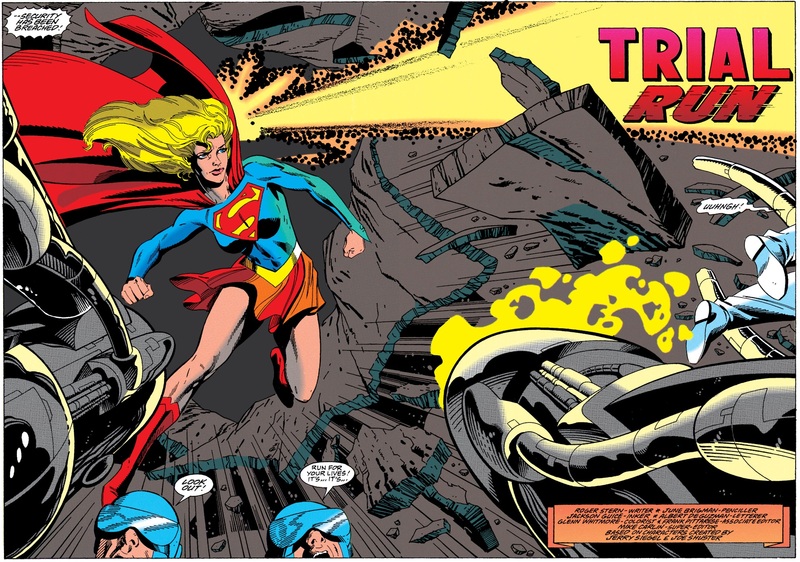 This was a Supergirl that had been as different from her former cousin as she could possibly be while also acting as a perfect reflection of the Superman brand and superhero comics in general at the time. Mae is young. Very young. She is, at best, a teenager and that is if we play with the comparable life experience that a protomatter being has to a traditionally defined human person. She is energetic, curious, and prone to fits upon discovering her trust been betrayed. She is exactly the type of teenage superhero we have seen time and time again except instead of trying to be her own person she must grow in the shadow of Superman with little of her own light filtering through. Mae can shapechange, telekinetically repel everything around her, and generally heal from any wound. She is fluid and not restricted to one thing or another, even gender, as she reminds the near omnipresent doctors and scientists who serve as the perfect excuses for a bit of the old exposition. She has only chosen the form that we all know and love because it was Superman who rescued her from her own dying world and brought her to his, complete with the only type of life he could provide: A version of his own. She dresses like him, befriends Lana Lang, and is raised by the very-much alive and surprisingly spry, Ma and Pa Kent. She has been forced into this role and this life, her potential squandered because she could be anything she imagined. Despite the manipulation of Lex, he at least asks Mae to question what she can do and how she can do it. There is a chance here to present a very different character the one that came before. That one had to run and hide because her cousin thought that the world was not yet ready for a woman with superpowers to be helping him in his crusade to protect every man, woman, and child from increasingly insane disasters. Mae is not burdened, as her subsequent version will be, with being a literal Angel of Heaven. She is not trying to accept her destiny so much as find her place in the world. She is the sole survivor of her world and literally the only one of her kind in all of existence. Her struggle for identity is entirely separate from Superman’s. During the Silver Age he knew that he was not alone once he met Supergirl but this version of that character will never have that feeling. Her life is one of potential solitude but she denies it in favor of embracing the world around her. Installing the “Superman.exe” character model onto her may have been the best way to save a few citizens from the Kryptonian criminals who destroyed her world but it also means that she will be best well known for impersonating Clark Kent after Superman “miraculously” returns from the dead. The people who surround her constantly remind her what a heel Lex Senior was and judge her for being with his “son.” The inevitable reveal of his shenanigans serves as a wonderful origin story of sorts, but in the end it is squandered as well. Lex, unsuccessfully fighting the effects of Kryptonite radiation poisoning, has decided that the world cannot possibly live without him, regardless of the fact that it was his own hubris which brought him to the brink of this particular flavor of disaster, and does all he can to stave off death. This includes seeing if he can reinvent the process that his alternate version used to create Supergirl in the first place. Mae’s journey in many ways embodies what a fictional character must go through. She began life as sentient protomatter, no more than a medium for ideas to flow into. Stern does a wonderful job at reminding us that Supergirl is not all powerful and does have the limits you would expect of someone still learning to control their abilities. Her appearance, gender, nationality, and superpowers were defined by those around her. Next comes the inevitable confrontation with copyright laws. What is Supergirl if not a brand just unique enough from Superman to be separately marketed and sold on its own? Not in real life, of course, but within the bounds of the DCU that is the case. Lex assures Mae that this is in her best interest and that none of the money will ever be used to fund a cause she herself would not support. Though not followed-up in any specific way (this version of the character would not receive an ongoing series) Mae is then confronted with the funhouse mirror versions of herself that Lex has created. Each one comes from their artificial wombs complete with costume and defining characteristics. None of them look like Mae, exactly, but they do not have to. Lex owns the copyright of what she is so why would he check with her before going to market with versions he believes will do well? The protomatter that Mae is created from can form clothing and so some versions have chosen the less flattering wardrobes of the female superheroes of the day. Supergirl is no stranger to having to prove herself against copies. She herself was created by Otto Binder, the same man who created Mary Marvel for Fawcett Comics and she was arguably surpassed in popularity by her Earth-2 counterpart Powergirl. Here she has the chance to prove to her aggressors that she is her own person and does so with “psi-blasts,” a power Superman never had. Mae is held back by being as close as possible to the idea of Superman. That brand cannot be altered, as too much merchandising rests on its shoulders, and it forces Supergirl to remain within that mold. If nothing else it would have been great to see a character who could shapeshift into and out of her secret identity without needing glasses, a slouch, and criminally unaware coworkers. We see part of this potential in what comes next. Unlike Clark Kent, Mae has no way of dealing with the ills of the world. No moral compass was installed as part of the “raised on a farm” service pack and raw, righteous fury leads her to take the fight to Lex. Her shape changes, almost unconsciously, and her former limitations seem to leave her. Why should Lex Luthor, father or son, be allowed to continue after committing such awful despicable acts? It is here that Superman makes his first and only on-panel appearance as he saves Lex and steers the story back into the comforting waters of what each and every reader unfortunately thinks of when they think of a Superman story. Not that we need a Supergirl who murders anyone (David S. Goyer was still only writing “The Puppet Masters” when this comic came out) but here we are shown that she is not even allowed to express her own rage. Yes, Superman teaches her right from wrong and yes everyone involved would have regretted Lex falling from a skyscraper but part of me will always look fondly upon the time the version of Supergirl that I first got to know threw a decrepit, old supervillain out of a building. Again, I will remind you that the man who once stole forty entire cakes was bedding a teenage (or younger) girl using a cloned body and a purple turtleneck. Matrix Supergirl is one of those wonderful anomalies from the nineties. She made sense within the context of the cold, clinical Krypton imagined by John Byrne and developed by Roger Stern with characters and concepts such as the Eradicator. This was a time in Superman’s storied history where his unflinching morality seemed all the more impressive for being set against such an impersonal heritage. Mae was the supporting character that this version needed and, creepy Lex aside, I believe that she could have been a notable and complex hero in her own right. I am not familiar enough with the later Peter David series to say for certain that we are poorer because of it but, regardless, Mae returned recently in two-part Convergence story. If you read it, let me know how it is. Keith Giffen and Ambush Bug are a good time no matter what.